Ardbeg pays a tribute to the traditional Scottish shooting party, with two 1974 vintage casks. Ardbeg pays a tribute to the traditional Scottish shooting party, with two 1974 vintage casks. Bottled in numbered, blown glass botles, the labels are made of animal-shaped, chiselled silver, and sealed with wax. 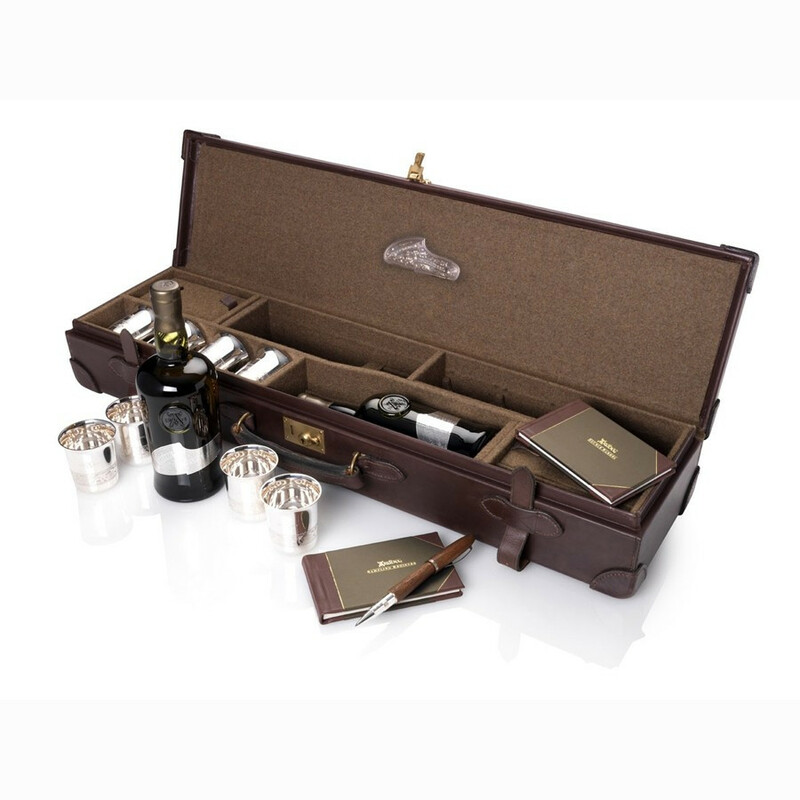 Presented in a shotgun case of leather and felt, accompanied with eight silver tumblers, chiselled by the official supplier of Her Majesty The Queen of England, Hamilton & Inches. This exceptional trunk includes also an Omas wood pencil and silver body, and two cellar books to write down all the gustatory sensations aroused by the bottled nectar. This shotgun case is a limited edition of 250 items. These 38 Year-old whiskies are today the oldest Ardbeg spirits. Please contact us for any further information regarding this exceptional product. The mythical distillery of Islay resumed its activities in 1997 after a long break. Located on the South-East coast of the Isle of Islay (South-West Scotland), the Ardbeg distillery (“small headland” in Gaelic) was officially established in 1815, when whisky became legal in Scotland. But the location had been known to hide “smugglers” for decades, clandestine distillers who crafted the best malts. The clandestine still of Ardbeg was set up in 1794. Located a few miles away from the beautiful Celtic Kildalton Cross, Ardbeg is one of the last remaining “Kildalton distilleries”. Just like Laphroaig and Lagavulin, it is constantly battered by the winter storms that hit the south coast of the island. A rare fact in Scotland, Ardbeg had always owned a malt-house with a specific feature: the malt drying towers weren’t equipped with ventilators. Hence, the peat smoke was even more concentrated during barley roasting. The malting areas have been operating until 1977. If the malt-house is no more in use today, the Ardbeg distillers impose the same standards to their malt suppliers. The water used by the distillery is extremely pure and also peated, as it comes from the Loch Uigeadail owned by the distillery. As the cellars sit by the sea, close by the quayside, they are laden with the iodized sea breeze. The incredibly peated and smoky character of Ardbeg Single Malt originates also from the malts used in the whisky making, offering great concentration of phenolic substances. Above all, the malt has been enhanced by the distillery’s specific device, as the stills are equipped with a “rectifier” located at the top of the column. This device rejects only the heaviest elements that return in the vat, and keeps only the lightest vapours, with the most refined and powerful flavours. This is why all of Arbdeg Single Malts are characterized with this elegant peated body which is nowhere to be found but here, in Ardbeg. Ardbeg has been, for a long time, the most peated Islay malt. At the end of the 1970’s, the Ardbeg distillery, property of the MacDougall family since its foundation, had a tumultuous history with several periods of closure as the owners change. This explains why Ardbeg Single Malts became scarce on the market. But when Glenmorangie purchased the distillery in 1997, Ardbeg rose again. Stocks preserved on site were rediscovered, the iconic 10 year-old Ardbeg Single Malt with its black label, distilled when the production started in 1989, is launched, and the production increased tremendously as of 1997, marked by the release of many new exceptional malts. Colour: deep gold with golden glow. Nose: intense and quite aromatic. Evokes rolling tobacco and pine needle. Evolves onto notes of creme brulee and lemon pie. Smoky aromas rise, powered with caramelised sugar, cinnamon and cloves. The true nature of Ardbeg is then revealed through eucalyptus and peppermint. Palate: lush, with buttery notes of caramel and candied oranges. A wave of smoke, salt and seaweed rips washes the sweet flavours. Finish: quite memorable. Sweet notes of liquorice stick, lingering onto cinnamon notes, cappucino and dark chocolate. Colour: walnut with golden reflections. Nose: lavish, quite enticing. Evokes a salad fruit of melon, kiwi, mirabelle plum, lime, sparkled with ginger and served with custard. Undertones of pine cone, resins and pine trees. Palate: full-bodied and oily, bursting with smoky notes and dark chocolate, vanilla and chocolate cookie. Finish: a mix of lemon, smoke and chocolate lifted with a bitter sweetness of expresso coffee.